Please join us in this fun and family friendly annual event where we aim to raise $35,000 to provide FREE corrective surgeries for 100 children in rural Viet Nam; at $350 per case. Community Engagement is one of our core operational principles. This annual event brings our community together, promoting active lifestyle and raising funds for a great cause. Every step we take on this walk and every dollar we raise, will help a child in Vietnam to discover the possibilities of walking, moving about on their own, and overcoming the disabilities most of them have known since birth. Walk-a-thon (WAT) is an annual fundraising event we have run since 2003. Net proceed from this fundraising event is allocated to the Hands For Hope Corrective Surgery Program. This program aims to provide 100 surgery cases annually at the cost of $350-$1,000/case. To date, we’ve provided free 1,258 surgeries for the children across rural Vietnam. And we welcome more partners to join. Would you like to volunteer with us on the day and be a part of this amazing event? We’d love to hear from you. 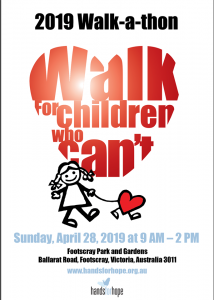 Please use the walkathon registration link. Aim: To assist poor children in remote parts of Vietnam, who are living with physical disabilities, which take away their self-reliance and prevent them from being able to fully participate in the community around them. The program coordinates and funds the necessary surgery and rehabilitation required to correct or alleviate their disabilities. To date H4H has completed over 1,258 surgery cases.